In Lesson 2 we're continuing on with Hot Cross Buns. In Lesson 1 we learned the song and explored the beat and the rhythm of the piece. This week we'll learn about solfege and how to incorporate it into a Sol-fa/Folksong lesson! 1. Teacher may want to preview the videos prior to teaching with your kids so you know what to expect. Try looking ahead on Saturday or Sunday of the week you do each lesson! 3. If you haven't watched the introductory videos, please do! It think they will really help you out! 4. If you need a starting pitch(note) for singing and you don't have a piano, use this link! 5. 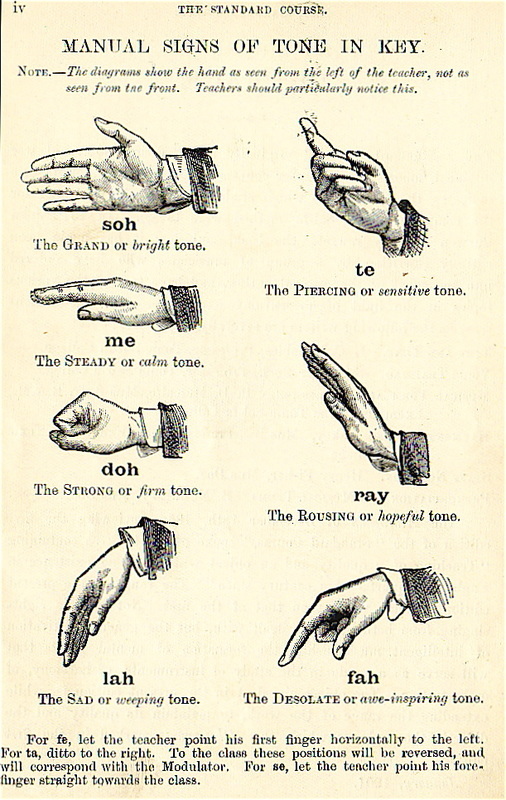 Please take note that the hand sign example is very old. Some things have changed throughout the years. Fa is now just a thumb sticking down. BUT I posted the image because I really like the descriptions below each hand sign. Please feel free to watch Video two with your kids and use that as the first half of your teaching lesson. Then spend another 5 minutes practicing what you learned or watch the video a second time. Any time I sing, you should echo, just like m 4 year old is doing. Try to encourage your kids to match my pitch. If they can't, be patient, but keep working at it! They will eventually get it with lots of repetition. Play the echo game through out the week for fun! Make up different patterns and sing them together! Sing Hot Cross Buns a few times to review the song. At first we'll just sing a few pitch patterns on the syllable Bum. (If you can play piano you can play CEG, GEC, GGE, GGC at first to train your own ear.) The goal is to mentally hear the space between different pitches. This is called the interval. In Hot Cross Buns, the melody Steps down. Mi, Re, Do. But Mason always moved from concrete to more abstract, so first just sing them on a neutral syllable. (Bum or La) You will understand more fully by watching the video. In this section we'll be learning Do, Mi, Sol at first and then adding Re so we can use the solfege to sing Hot Cross Buns. This next video shows how to extend this lesson with older, advanced students. This doesn't involve harder sight singing pieces yet, but allows the older student ( who can already sight read from private lessons) to practice their inner listening skills and to try and dictate rhythm and pitch in music. This is the Pitch/Tonal lesson. Give it a whirl. If it's too hard, do the family lessons for a few weeks and then try again after you have trained your ear a little more with the different intervals! I said in the video that you can buy staff paper, but you can also get free Staff Paper here and print it at home!